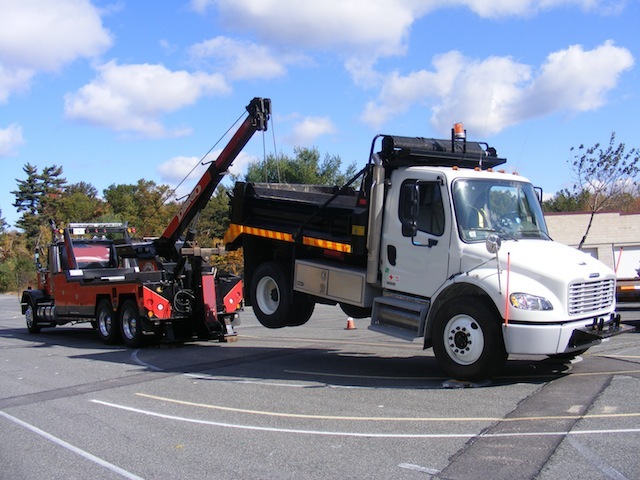 Heavy Vehicles bring unique challenges to the accident investigation process. Since their characteristics are often not as well defined as passenger vehicles, testing is useful to determine the properties that may have led to the accident. 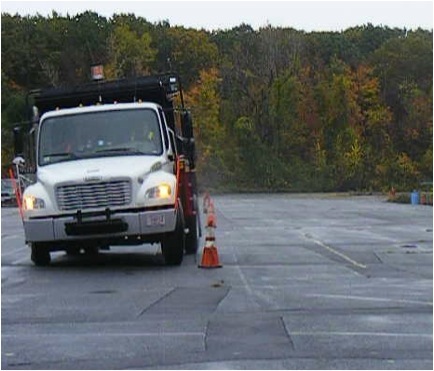 Heavy Vehicle testing can involve finding the center of gravity (necessary for roll over calculations), dynamic roll testing, or simple acceleration and braking tests. In order to measure the center of gravity, the vehicle must be lifted at one end while the other axle is weighed. 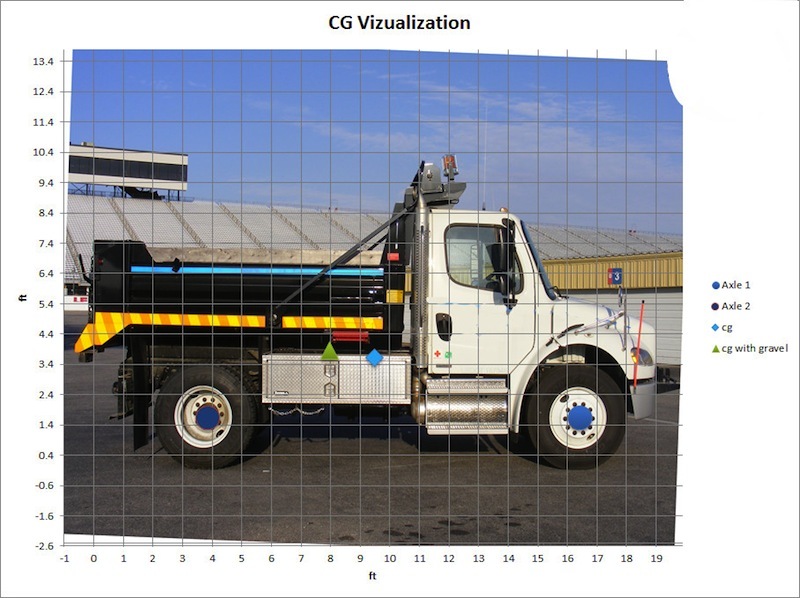 In the photograph to the left, the front tires can be seen on industrial grade scales, which are very accurate despite their ability to handle enormous loads. While weight measurements of both axles on level ground allows the horizontal center of gravity to be measured, the vertical center of gravity measurement requires the vehicle to be lifted at one end and simultaneously measured at the other. Additionally, the height of the lifted point is measured. Finally, this process may be repeated in order to determine the effects of loads or different truck configurations. For instance, a truck may have a load of gravel in its bed, which generally will raise and move rearwards the center of gravity. Alternatively, trucks may be equipped with winches or other tools mounted on the front, which will shift the center of gravity forward. While center of gravity testing can approximate the required lateral acceleration to tip over, dynamic roll testing takes into account other real world variables such as tire pressure, suspension effects, and steering input. These variables can be extremely difficult if not impossible to model, and therefore empirical testing must be performed. The photo on the right shows a vehicle which is experiencing significant lateral acceleration due to a swerve to avoid the cone. This vehicle is equipped with measuring devices and then driven through a course at increasing speeds. The vehicle's acceleration and path are then plotted against time. See the vehicle driven through this course. Acceleration tests can show the maximum speed a vehicle may reach by accelerating from an intersection or driveway. Braking tests on the other hand can show the top speed from which a vehicle could have been travelling before stopping (or coming to impact). Of course, while the acceleration values in tables are usually given as an average over a speed range, testing allows a determination of the exact acceleration at any given speed. Tire marks provide an easy way to calculate the average deceleration (braking) value of the vehicle, and check that this value corresponds to the decceleration determined from the onboard measuring device, called an accelerometer.